Korean skin care believes in taking care of skin rather than applying more of makeup to hide skin problems. We all know BB, CC creams were first made in Korea and now they are an integral part of almost every girls' make up kit. The website Skin18.com, founded by Eugeine Shek, aims to bring Korean skincare to people all over the world at an affordable prices. Take a look at the range and you will be spoilt for choices and will feel like buying all the stuff. Currently there are many discount, freebie offers on the website. They provide free shipping on over $40 purchases. 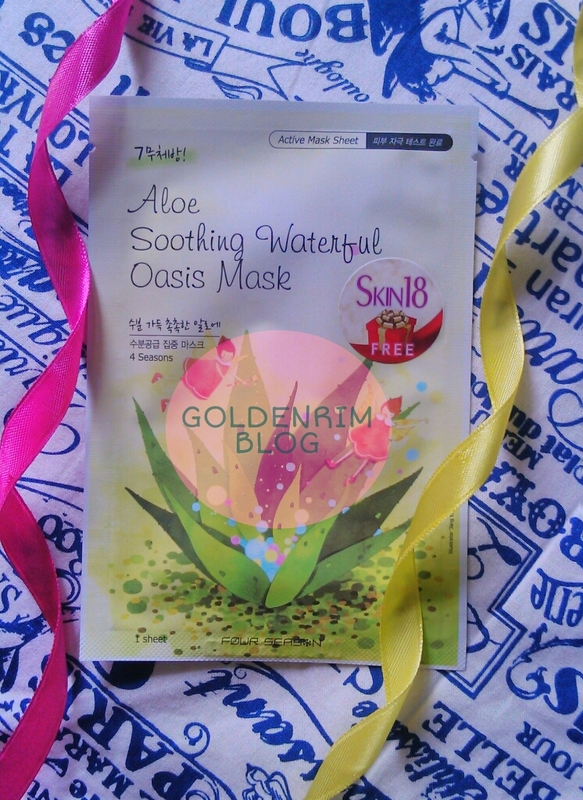 Let's take a look at the mask which I tried from skin18.com that is Aloe Soothing Waterful Oasis Mask Whitening effect. 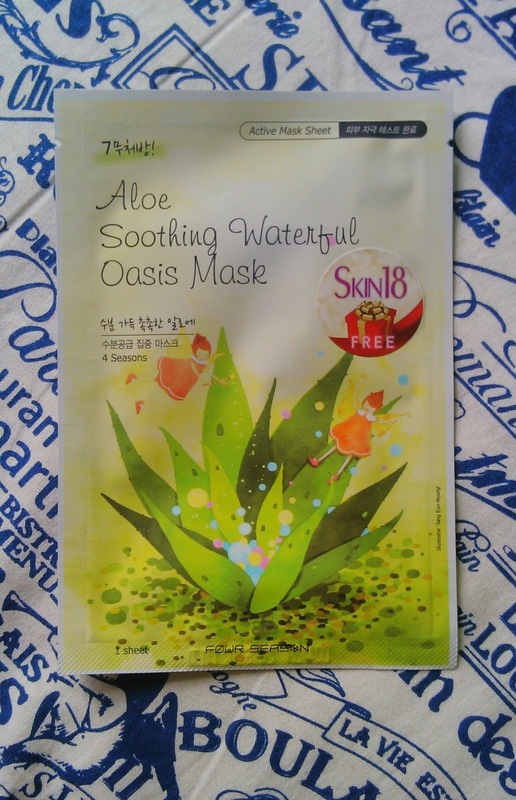 The whitening functional mask sheet contains essence derived from natural aloe that soothes irritated skin and provides abundant moisture to create radiating, smooth skin. Water, Glycerin, Butylene Glycol, Niacinamide, Dipropylene Glycol, Aloe Barbadensis Leaf extract, Panthenol, Triphenyl Trimethicone, Cetyl Ethylhexanoate, Xanthan Gum, Carbomer, Portulaca Oleracea Extract, Camellia Sinensis Leaf Extract, Hamamelis Viginiana Extract, Dipotasium Glycyrrhizate, PEG-60 1, 2-Hexanediol, Caprylyl Glycol, Propanediol, Sodium Polycrylate, Sodium Hydaluronate, Disodium EDTA, Alianton, Ceteth-20, Ceteth-10, Cetearyl alcohol, Tocopheryl Acetate, Fragrance. The fragrance of the essence in mask is quite good. I don't like much fragrance in beauty products. I used the mask in morning. I applied the mask on cleansed and toned face to maximize the effects. The mask fits quite properly (at least to me) with a few folds. The mask gives a soothing effect and cools off the skin instantly. 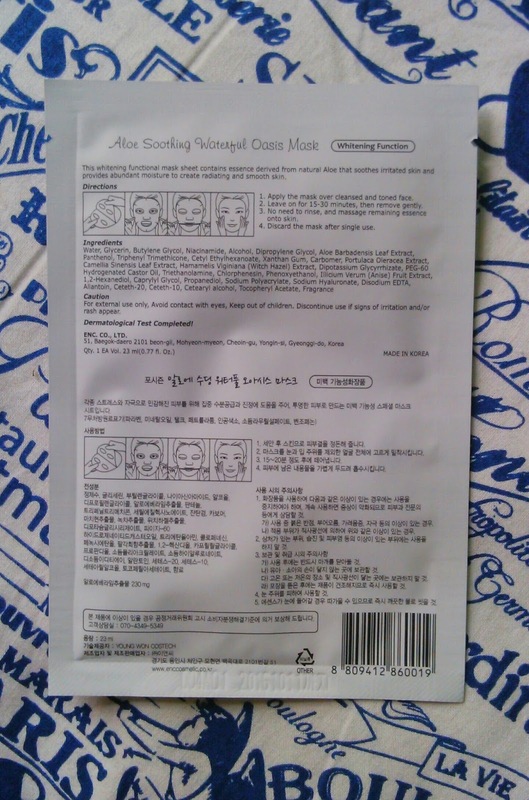 This is the first time I have used a mask, that too Korean. I kept it for around 30 minutes (greedy me :P) and removed it slowly and properly. Little essence was left which I dabbed on my face so as not to waste it. My skin was hydrated and I was happy with the first time results. Hydrated skin looks so good and feels oh so smooth. I didn't feel the need to hydrate my skin for about 24 hours. After the using the mask I avoided washing my face for whole day and washed at bed time directly. The whitening effect as such was not felt but with just one mask you cannot expect that. You need to use at least 2-3 masks in one week to see amazing results . Availability - On Skin18.com website at affordable prices. I was overall happy and satisfied with the mask. It's also very easy to use as well as travel friendly. You can take it anywhere you want, without any hassles. It gives soothing effect according to its claims and makes the skin smooth and evens the tone of the skin. Repurchase - Yes, but at a discounted price! Recommendation - Yes if you are or are not a fan of Korean skincare then this is a must try. It is something new to try out and keep your skin healthy. Tell me your thoughts on this?